Win a pair of tickets to an Exclusive Jun Tanaka Demonstration! 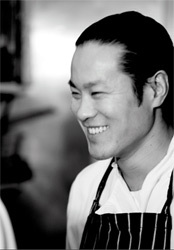 Jazz up your cuisine this summer with an exclusive demonstration of BBQ techniques by celebrity chef Jun Tanaka. On Sunday 8 August 2010, for one day only, the five-star Renaissance London Chancery Court Hotel – home to Tanaka’s glamorous Pearl Restaurant and Bar – will close its historic courtyard exclusively for the afternoon demonstration. During the session, guests will watch a demonstration of dishes ideal for al fresco entertaining, sample a selection of these dishes, and question the chef on any cooking queries. Tanaka will demonstrate eleven Alternative BBQ Recipes, which can easily be recreated at home to impress friends this summer. Love Food Love Drink has teamed up with Pearl Restaurant to offer you the chance to win a pair of tickets to the exclusive courtyard event. - The prize is for a complimentary pair of tickets to Jun Tanaka’s Exclusive Al Fresco Courtyard Demonstration on Sunday 8 August 2010. - There is no cash alternative. Travel and all extras are not included in the prize. - The prize winner must be over 18 years of age.